Greetings from beautiful Cloverdale, California. 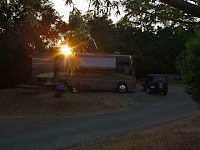 We're hanging out with our Winnebago friends this weekend at the Cloverdale-Healdsburg KOA. It's been so perfect we've decided to stay an extra night. This is not your run-of-the-mill KOA. 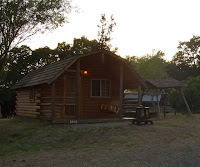 While most KOAs offer a convenient spot just off the highway to spend a night or two, this place provides an out-of-the-way escape in Sonoma County wine country. 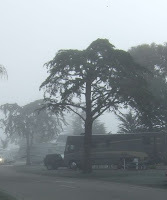 The campground is located six narrow and windy miles from (and above) Highway 101. 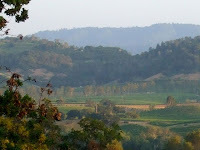 Situated on the top of a hill, there are nearly 360-degree views of vineyards and tree-covered hillsides. It's definitely tucked away! Any way you want to camp, you can do it here. There's plenty of room for RVs and tents. And, if you don't have either, you can choose one of their cozy Kamping Kabins. Pretty convenient! Like most KOAs, the place is crawling with kids of all ages. Several school groups hosted campouts here this weekend. There were preschoolers, mothers and sons and quite a few families just enjoying the beautiful weekend. They've been fun to watch. The Chardonnay Travelers made a good showing this weekend, with 15 or so coaches bringing their owners along. It was a very special weekend as some members who haven't been able to attend recently made the trip. And, another couple who came as visitors left as new members. It was wonderful to see all of these great people. We look forward to seeing them again soon. It's another beautiful day in the neighborhood. So, we're off to do something. Surely we can find a geocache or two around here. This post is for Doug. 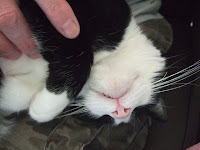 He's a regular follower of our blog, and he says we tend to leave readers hanging. We take you places, then never let you know we made it home. Well, Doug, we're home. Thought you'd like to know! 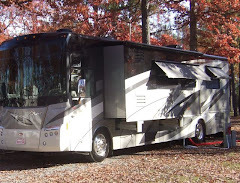 This post is also for Gordon, our RVing "godfadda". He's accused us of only showing photos with P. So, this shot of both of us enjoying our last sunset at Pismo Beach is for you! This post is also for Dana. We thought of him and his lovely wife many times this week. We were in their part of the country. And, a beautiful part of the country it is! 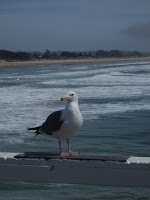 Dana caught up with our blog and sent us a very helpful email with things to do in Pismo and surrounding areas. Unfortunately, we were on our way home in bumper to bumper traffic in San Jose when he sent it. But, thanks so much for thinking of us! We're home safe with lot of things to keep us busy for awhile. But, watch this space. We'll be on the road again soon. Today was one of those days that didn't go as we planned, but turned out great. With clear blue skies and warming temperatures, we definitely had a lot going for us. We had planned to drive north to Paso Robles to pickup a semi-annual delivery from one of our favorite wineries. But, when we called the winery this morning we were informed it's already en route to our house. We opted for closer sightseeing in the very quaint little town of Arroyo Grande, which is just a couple of miles inland. One of our travel resources reported that "AG" hosts a farmers market every Wednesday afternoon. Turns out, it's actually Saturday afternoon. We're sorry we'll miss it. With a craving for familiar farmers market fare, we headed off to a deli that, according to reviews, features tasty sausages and brats. Upon our arrival, we discovered the place just recently reopened as a "Rooster and Roast". Since it was apparent that none of our plans were coming together as planned, we surrendered to fate and enjoyed a very tasty chicken burrito, chips and salsa in the sunshine. After lunch, we took in the sights. 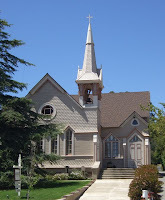 Arroyo Grande takes great pride in its village of some 20 historical buildings from the late 1800s and very early 1900s. The church above was built in 1887 for the Methodist Episcopal Church. 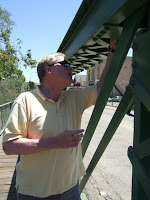 Arroyo Grande means "big stream" in Spanish, and the town lives up to its name. 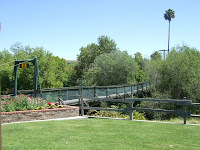 This "swinging bridge" was originally constructed in 1875 and is the only one of its kind in California. It doesn't exactly "swing". It bounces! The rock solid Bridge Street Bridge was erected in 1906. Today, it's the home to our 502nd cache find. We're well on our way to 1000! Almost three years ago, we discovered geocaching. Today, we celebrated a milestone: we found our 500th cache. We'd been sitting at #494 since January 31st on our trip to Rio Viento. We were becoming pretty rusty cachers! 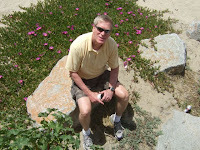 So, our mission on day two in Pismo Beach was to find six caches. Greetings from the beach! 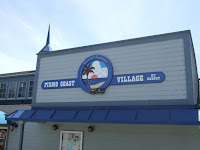 We headed 250 or so miles south yesterday and landed at the Pismo Coast Village RV Resort in the quaint central coast town of Pismo Beach. We're here for some much deserved weekday R&R. And, it looks like Mother Nature is treating us to a few glorious days by the sea. The morning after a travel day is a special time to rest and relax. 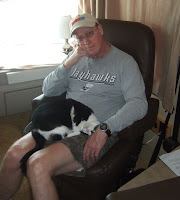 With a cool, foggy start to the day, P was content to welcome our girl kitty to hang out in his lap. Here's a close-up. Now, that's one happy kitty! 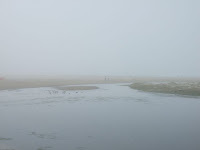 By noon the fog cleared and we headed out after lunch to explore the park and Pismo Beach. 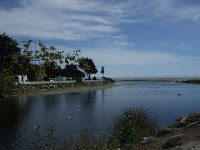 This is view of Pismo Creek as it heads to the Pacific. Our park is on the left. 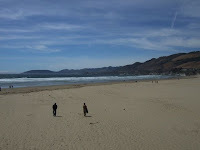 Pismo Coast Village is a 400-site park in an ideal location. With full hookups, a general store, laundromat, community room and a beach, we have everything we need! 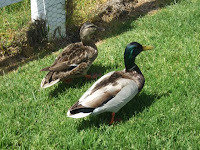 The cats have especially enjoyed keeping an eye on the ducks who pass through our campsite. 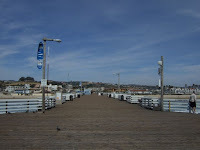 The center of Pismo is just a couple of blocks away. 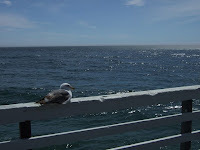 We poked our heads in a few shops and strolled the length of the Pismo Pier. There's a cache here somewhere. We'll be back soon to find it! This shot pretty much sums up our day at the beach: Perfect.